He’s come a long way from dressing his pencils in tissue paper as a six-year-old in Koster, and now flamboyant fashion designer Gert-Johan Coetzee wants to make some other young fashion lover’s dream come true. 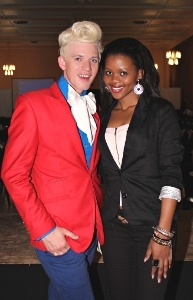 The search is on for a student to benefit from the Gert-Johan Coetzee bursary for studies in fashion design from the North West School of Design in Klerksdorp, where South Africa’s designer to the stars graduated in 2005. The R160 000 bursary covers tuition and study materials for the duration of the brand-new three-year BA Fashion Design degree course that the school will offer from 2014, and includes a high-end Bernina sewing machine and overlocker worth over R30 000. The winning candidate will also benefit from having Coetzee as a mentor and will have the opportunity to serve an internship at the designer’s thriving Johannesburg studio. Based in Klerksdorp, the North West School of Design offers a full spectrum of fashion courses that includes webinars and Skype conferences with international fashion colleges and lecturers, exposing the students to international best practices and insights, to align the college with global standards. This in addition to the input of people such as Gert-Johan Coetzee who run successful businesses in the South African fashion industry and offer practical advice to students and lecture staff alike. “The North West School of Design is a small college so our students benefit from smaller classes where they get personal attention and assistance every step of the way. Ultimately we form a fashion family that extends beyond the time students spend earning their degree,” says NWSD principal Marlene Oosthuizen. The closing date for entries is 30 September 2013.